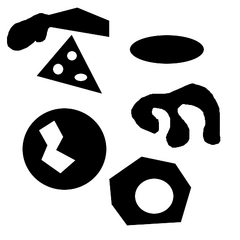 Fitted polygons. Red for external contour and blue for internal contour. 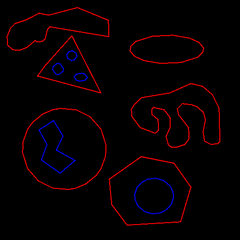 Demonstration for how to fit a polygon to object contours and edges. The input contours can be found from binary blobs and the edge sequence from Canny edge detector. This is often a useful preprocessing step before applying a higher level image processing algorithm. * Fits polygons to found contours around binary blobs. * points can be a bit noisy compared to the others. * easier to deal with than working with Canny edges directly. This page was last edited on 16 October 2018, at 19:54.